It’s important to know how the software and hardware we use to create our illustrations works. These days, most of us never even think about how we are able to create the digital images that we do. Except on that rare occasion when we run into a problem. That’s because software developers like Adobe have done an incredible job automating things to make our digital work easier. It wasn’t always that way in the past. Nowadays, the learning curve we experience with software programs focuses on tools and techniques, rather than on how to get the software and hardware to cooperate with each other. Performing operations in Photoshop takes a great amount of processing power. To do this Photoshop accesses the hardware chip RAM or “random access memory” that is available for software processing of operations. This is fairly typical of how all applications work. However, for complex operations, which are most of the processes in Photoshop, the program quickly uses up the hardware RAM. So Photoshop makes its own RAM, which is called a “scratch disk”, by converting unused hard drive memory into “virtual RAM”. So, the more open hard disk space your computer has available, the more fluidly Photoshop will work for memory intensive tasks, and you probably won’t even be aware that Photoshop is doing it. When there isn’t enough free space available Photoshop will produce a “Scratch Disk Full” or “Scratch Disk Error” message. Example of a Photoshop scratch disk error. For those who store their entire music library, photo library, and video library on their computers this can easily happen. The key is to look for a solution that will have the lowest impact for you. Below are some suggestions. Purge your hard drive of non-essential files by archiving them or moving them to a storage device. iTunes also has a habit of creating and storing duplicates of your music files. Close applications and startup items you are no longer working with. Applications including Photoshop create temporary “.tmp” files, like files that are held in the clipboard. If you have several applications or documents open there can be several temporary files hanging around. On a personal note, I have found that streaming a music service to your computer while you are also working on it can slow things down. 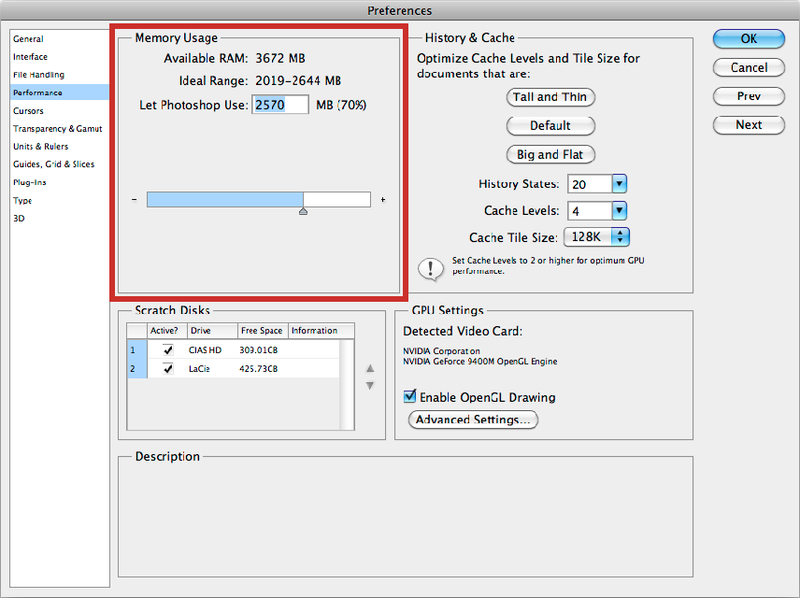 Add more “virtual RAM” to Photoshop. 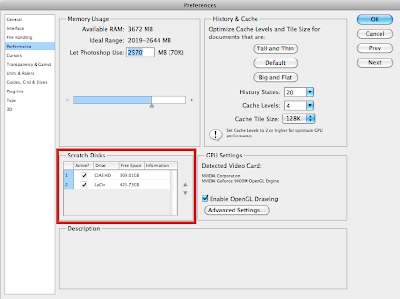 Select Photoshop's preferences (Photoshop > Preferences > Performance) and use the Memory Usage area of the screen to adjust the memory allocation. Adobe recommends the allocation to be approximately 70% of available space. 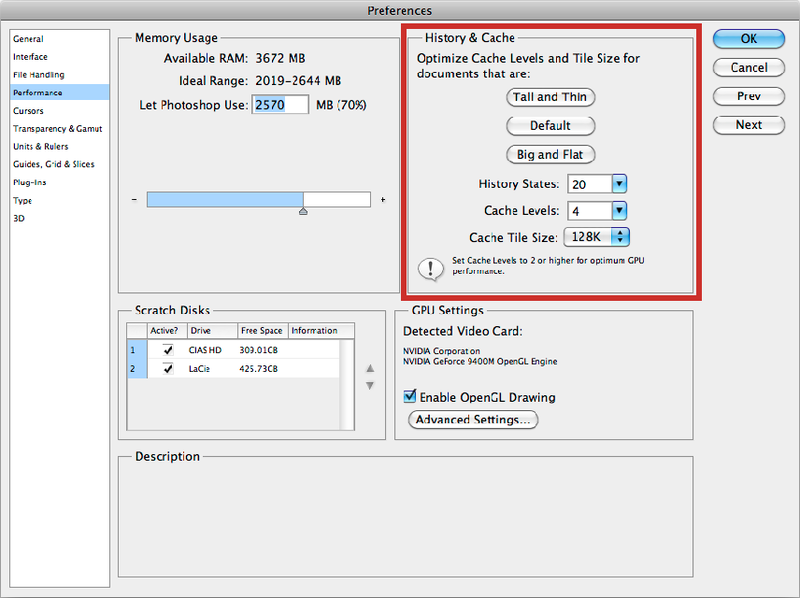 Memory options allow a user to control the virtual RAM. Adjust the image cache and/or the number of history states. Essentially, the image cache takes snapshots of the screen that are used to speed up the refresh/redraw process. So when a portion of an image is changed, the computer can quickly redraw the changes without having to reprocess everything in the image that wasn’t changed. The history keeps a legacy version of the image for each alteration that occurred through a given number of states. In Photoshop the default number of history states is 20. The more history states designated the more memory is used to maintain them. Select Photoshop's preferences (Photoshop > Preferences > Performance) and use the History & Cache area to make adjustments. states and the cache levels. Purge clipboard, undo and history. This is a short-term option, however if you know you won’t need to use your history states, or the clipboard it might be worth your while to take advantage of these house cleaning options. From the edit menu select (Edit > Purge). Purge offers options to clear undo, clipboard, and history. Designate a different drive as the scratch disk. This is an Adobe recommendation. Even terabyte capacity hard drives are now relatively affordable, and you should have a second drive to store your files on as insurance anyway. I’m always amazed when I talk to illustrators who are working without any form of file backup. I recommend a second drive rather than a drive partition. The default scratch disk is the same disk that has contains the computers OS. 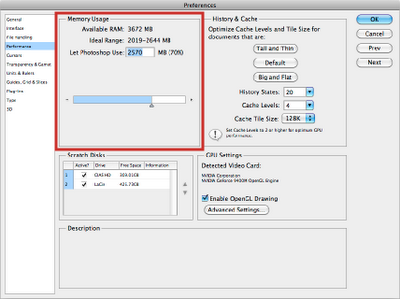 To designate a different scratch disk, select Photoshop's preferences (Photoshop > Preferences > Performance) and select the disk that you want Photoshop to borrow RAM from. 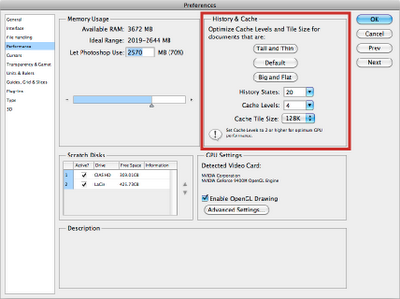 In the example below, I can more than double my available scratch disk space by selecting a second disk drive. Scratch disk options allow a user to customize drive selection. Be efficient with your file size. Don’t short change yourself for possible resolution needs in the future, but don’t think you need to use the maximum file size Photoshop will support of 30,000 x 30,000 pixels and 200” x 200” either. Photoshop offers an option to check the efficiency of your document. The document status panel offers the option to check the document efficiency. Other options remain, but I would classify them as high impact, such as buying a new computer, replacing a CPU, adding RAM chips, etc. There are also some workarounds that involve strategies that will result in data loss that I would avoid, such as changing the bit depth of your file to speed up performance, or reducing image resolution to make operations behave better.